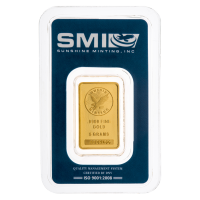 5 غ من السبائك الذهبية الخاصة بدار سونشين These attractive gold bars produced by Sunshine Minting are an excellent investment opportunity. The reverse of the bar features the pattern of Sunshine Minting logo. The circle in the middle is the SMI "Mint Mark SI" security feature that will be incorporated into the reverse of every new SMI branded bullion product. While it is not visible to the naked eye, when viewed with a unique decoding lens, the security feature becomes visible.